As scrubEx is relatively new to the Western Canadian healthcare linen industry, there are many questions about it and understandably so. Hospital scrubs, for the most part, have always been distributed in the same way, for as long as anyone can remember. So, we’ve come up with the most frequently asked questions or concerns about this magnificent beast that is automated scrubs distribution. 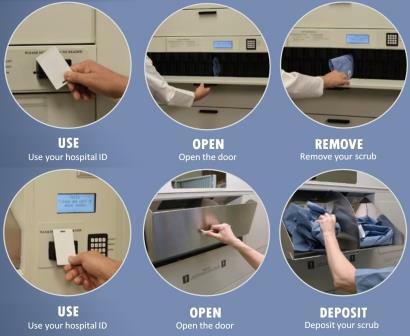 scrubEx is a medical scrubs dispensing machine that controls the point of distribution by only allowing access to authorized users via the user’s existing hospital ID tag or badge. To receive scrubs, staff swipe their badge, open the receiver slot door, take their scrubs, close the receiver slot door. To deposit scrubs, staff swipe their badge, open the deposit door (one door with two sections: one for tops, one for bottoms), deposit their scrubs, close the deposit door. *A unique and proprietary feature of scrubEx is that the scrubs don’t move inside the machine. On the contrary, the applicable slot door opens, thus saving crucial dispense time. How are scrubs tracked when a user swipes their hospital ID badge? When the scrubEx system is set up, there is a pre-determined amount of credits awarded to each user. For example, let’s say each user is given three credits. Dr. Evans goes to get her scrubs. She swipes her badge and 1 credit is subtracted from her total of 3. She now has 2 credits. When Dr. Evans returns her scrubs, she is returned 1 credit. So, she will once again have 3 credits. Dr. Evans can use and return as many times as she wants. There is no limit on that. The only limit is on how many you can have out at a given time. How much money can I save with scrubEx? Please note that hospital savings are dependent on proper use of scrubEx management system. Is there only one size scrubEx machine, or does scrubEx come in different sizes and capacities? Essentially, there are three scrubEx dispensing machine sizes: small, medium and large. scrubEx SV is the smallest machine. It comes as a combination of dispenser and receiver. scrubEx MV is the medium machine. It also comes as a combination of dispenser and receiver. scrubEx LV is the largest machine. The dispenser and receiver are separate units. Please note that folding, loading and dispensing are the same for each unit. How many scrubs does scrubEx dispense per day? This is a bit of a relative answer, as theoretically, the machines can dispense as many scrubs per day as the amount of times it gets reloaded. But the whole point of efficiency is to load it as few times as possible while still catering to the needs of the users. The following is what we have found in regards to how many users each machine serves per day, on average, and how many scrubs each can hold at one time. 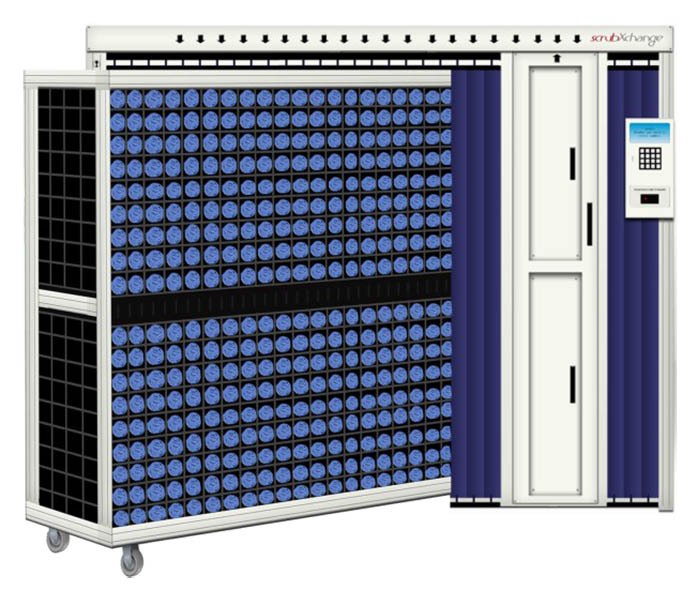 This system allows laundries to build a world-class scrub rental program for hospitals. Clean scrubs are laundered, delivered, and easily loaded into the machines to streamline scrub and linen distribution at the hospital. scrubXchange helps improve service, control infection and generate cost savings for both the laundry and the hospitals they serve. It’s simple, load clean scrubs into the cart at the laundry plant. Swap carts out of the units at the hospital. How long does it take to load a scrubEx dispenser? The small scrubs dispensing machine takes approximately 5 minutes to stock. The medium machine takes approximately 7 minutes to stock. The large machine takes approximately 10 minutes to stock. Does scrubEx hold mixed sizes or only generic sizes? Here’s what our research has found on common scrub sizes and mixed scrub sizes. Most of the time, 80% of scrubs are common sizes (i.e. large shirt, large pants). 20% are mixed sizes and of the 20% of mixed scrub sizes, 80% of those will be ‘common mixed scrub sizes’ while the other 20% is uncommon mixed scrub sizes. So to answer the question, yes, scrubEx holds both common and mixed sizes. How does scrubEx know how many common and mixed sizes to have available? One of the beautiful features of scrubEx is that users will pre-input their preferred size when the scrubEx system is getting set up (users can change their preferred size at any time via the keypad on the dispenser). That way, the supply staff know exactly what sizes are going into the machine and what sizes need to be replaced. Tell me more about pre-determined scrub sizes for users – how does it work? When the scrubEx system is getting set up, users are sent a website link where they enter their preferred scrub size. Once the user swipes their hospital ID tag or badge, the machine knows exactly who they are, and which scrubs are theirs. So, after Dr. Evans enters her size of small shirt/medium pants into the system, whenever she swipes her badge, scrubEx knows that there is a small shirt/medium pants that is specifically for her. As there may be more than one person who wants the same size as Dr. Evans, scrubEx can be configured to have several uncommon scrub sizing pairs to accommodate non-regular users. The most fascinating part about this is that the more you use the scrubEx dispenser, the better the analytics get and the more efficient the scrub sizes become. Will scrubEx ever run out of scrubs? scrubEx gives your hospital staff the tools they need to make sure that this never happens. The clearView linen management software that comes with scrubEx and alEx provides real-time inventory analysis and notifications. Supply staff will receive text messages and emails when a diminishing scrub size reaches a pre-determined threshold. Staff can then do targeted inventory reloads to the specific scrubEx dispensers. So the only way scrubEx will ever run out of scrubs is if no one reloads it (which then falls back onto them for missing the notification). 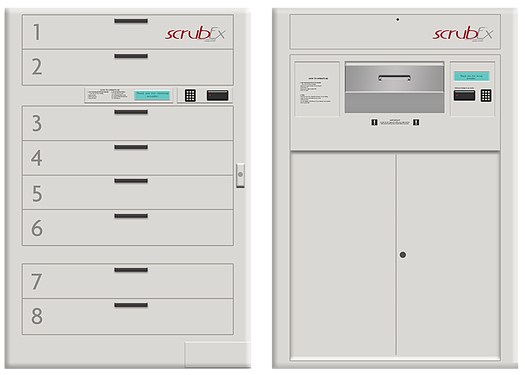 How long does it take to dispense scrubs for scrubEx and scrubXchange? The dispense time for scrubEx is between 2.1 and 4.8 seconds. The average dispense time for scrubXchange is 10 seconds. What happens if a staff member uses all their available credits? If in the case that a staff member uses all their credits, they could just go to the OR Front desk, where there is an administration badge. What if a non-registered user comes into the facility and needs scrubs? Sometimes, there are vendors, students or others who come into the facility on a non-regular basis. Obviously, it would be disadvantageous to have these people registered in the scrubEx system. Luckily, there are several options. Option 1: Put them in the system. It doesn’t take long, and the user is updated right away. Option 2: Have the person with a master scrubEx badge take out scrubs for them. This option would require that the person with the master badge make sure the person returns the scrubs. Option 3: Add a vendEx dispenser to your facility. vendEx users pay a small fee to access scrubs and have 24 hours to return them or face losing scrub privileges in the future. This can be a revenue-generator for hospitals. Will the scrubEx dispensing machine cause congestion in my locker room? The location of the scrubEx dispensing machines is a critical logistic that we will work together with you on for optimal placement. The machine does not need to go in a locker room, often they are placed in hallways which allows them to serve both male and female users. The relative answer is that it depends. Every locker room is different. However, scrubEx machines have very small footprints. Will a change in our linen management/distribution system cause staff frustration? The whole reason why you are considering scrubEx is because of existing staff frustrations. The open cart system has many frustrating issues that scrubEx eliminates. The slots are predetermined, so they know exactly what goes exactly where. They will know in real-time which scrubEx dispensers need reloading, which will make their jobs more efficient. Because they’ll know which scrub sizes are running low, they will no longer receive angry phone calls from people who cannot find their scrub size. No more rummaging through the open cart for your size, often to find out it is not even available. You can expect to get your correct size every time. Within a few seconds, you will have your specific scrub size in hand. It’s like having your own “parking stall” for your scrubs. As long as the supply staff act on the real-time notifications, users will always be able to get their size. They will know that no one has compromised the quality of the scrubs, as they have been under lock and key since being loaded. Where they couldn’t previously measure or track scrubs inventory and loss, they now have that capability through the clearView software. Before, they could not tell which staff members were responsible for not returning scrubs. Now they know who as well as how many. They no longer receive the complaints that used to work their way up the chain of command! My linen budget doesn’t allow me to add anymore employees. Will a scrubs dispensing system cause more work for my linen staff? So really, the two automated scrub dispense systems are making loading easier, faster and more efficient. What kind of training does scrubEx require for users? The scrubEx dispenser is designed to function similar to an ATM or vending machine, so training people on how to use the machine is minimal. Additionally, there are on-screen prompts to guide the user. How does scrubEx know when a scrub is being returned as opposed to a towel or other piece of linen? Every time a user deposits used scrubs, the receiver takes a high-definition image of the contents, as they fall into the machine and records it against that user’s deposit. In the event you receive a foreign object in the receiver, you can go back and see exactly which user deposited that item. The user’s ID number and date of return get recorded, as well. What exactly is the clearView software? clearView is a web-based server application that monitors the levels of the contents in real-time and notifies supply staff with updates. Staff are notified every time a pre-determined threshold is reached. The appropriate staff then receives notifications that they need to act on. Any computer in the hospital with web browsing capability can monitor the status. clearView also makes reporting and analysis easier with standard or customized reports (organized by user, department, scrub suit size, etc.) which can be displayed digitally or printed. What happens if the hospital network goes down? In the rare case that the hospital server goes down, all scrubEx machines continue to track credits and transactions, while talking to each other. Credits and transactions re-sync with the system all of the once service is restored. The user will never know the difference. What happens if a nurse takes out a scrub in the L & D department and deposits it in the OR receiver? All of the scrubEx machines talk to each other over the hospital network. If a user takes a scrub from one department and deposits the scrub in a different department, all machines get automatically updated in real-time. What if I don’t want users having access to dispensers or receivers in other areas of the hospital? The software allows for the customization of every user’s access to be for specific machines or hospital-wide access. Are the benefits of scrubEx proven or substantiated publicly? Being a product that is still relatively new to Western Canada, there are plenty of scrubEx case studies from hospitals in the US that you can review. Meditek is pleased to be the exclusive distributor for scrubEx and alEx for Western Canada. IPA, the manufacturer of scrubEx and alEx, has 90% of the market share for automated linen dispensers and have systems installed in over 1,000 hospitals across Canada and the US. In business, some of the most dangerous words ever spoken are “but, we’ve always done it this way”. We’re here to help you with that transition of doing things a better way. Thank you for reaching out to us! We will have your representative Scott reach out to right away. I am the Director of Surgery at The Miami Medical Center in Miami, Florida, USA. I would like to get in touch with the ScrubEx representative in my area. Please have the rep contact me at the email address below. Hello Vivienne, thank you for reaching out to us – a representative will be in contact right away. I am Director of Materials Management and I would like to speak with a representative in the NH area. Please email me their contact information. Thanks for reaching out to us! IPA in Atlanta is the manufacturer and we are their representative in Western Canada. I have emailed you a contact at IPA. I am the Unit Theatres Manager at The Prince Sultan Military Medical City (PSMMC) in Riyadh, Saudi Arabia.I would like to contact with the ScrubEx representative in my region (Middle East). Please contact me at the email address below.